Protect your clubs while travelling. The Clicgear® Shaft is designed to provide added crush protection to your golf clubs while travelling. The Patent Pending Clicgear Club Strap keeps drivers and other clubs under the protection of the sturdy end cap. Adjustable from 41” – 53”, (105cm – 135cm) and with a stored length 27.5” (70cm). The Shaft is built from super strong aluminum tubing and fibre nylon plastic. 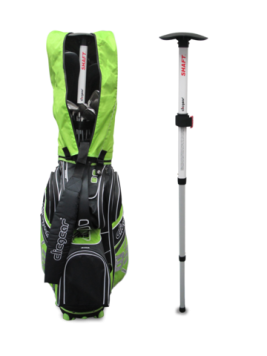 This product fits almost all golf bags and junior golf bags, and provides superior protection while using travel covers to ship your clubs. The Shaft uses a removable protective cap for storage while not in use.